As I said, I’m not getting out much these days. So I did a bit of visiting today – a reflex action for clergy from my tradition of ministry – and took myself off to the East Neuk of Fife. Which meant testing whether the Polo will also achieve 65 mpg over – or under – water since most of the road from St Andrews seemed to be submerged. If you haven’t seen these villages which line the southern coast of Fife, give yourself a treat. They’re delightful former fishing villages tightly grouped around small harbours in a jumble of small streets. 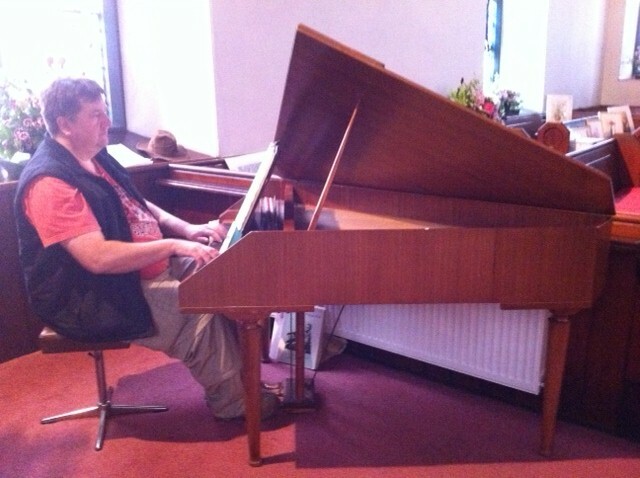 It also happens to be festival time – so I found this harpsichordist hard at work on John Blow and Scarlatti in St John’s, Pittenweem. As I crossed over the Dundee-Perth road on the way home, I saw a line of police vans – maybe heading south. As one does, I listened in awe to the dignity of the father describing the death of his son last night. But for the rest, I’m not so sure. I feel that I have spent much of my life listening to politicians talking tough and offering security-based solutions to complex social and political problems. Of course order on the streets must be restored. Of course people must pay the price for destroying, looting and burning. But I don’t think I have ever heard so many people saying that they simply don’t understand where this violence has come from – which must tell us something about the complexity of the causes.